What could be better than dairy-free "white" chocolate that's both vegan and unrefined? Rescue Chocolate's new "Like White" line of euphorically-flavored chocolates are made with the purest natural ingredients including a superfoods concoction of chia seeds, vanilla bean, cashews, Brazil nuts and more, giving you something that's not only indulgent, but that's also actually good for you, too! 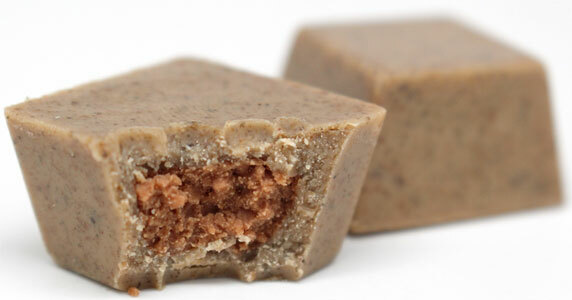 Each box of White Chocolate Biscoff Truffles contains 8 individual bon bons that take this amazing vegan superfood chocolate and pack each one full of creamy Biscoff (aka speculoos), giving you a one-two flavor punch that'll leave you wondering why nobody came up with this combination sooner. Normal white chocolate is truly elevated to an unprecedented level of richness and flavorful complexity with these awesome truffles from Rescue Chocolate, and as always, 100% of net profits from these bars will be donated to animal rescue groups to help our furry friends in need. $15.95 per package. *NOTE* Chocolate can melt in the summer heat, especially if your desitnation area temperature is in the mid 80's or above when the package takes more than a day or two in transit. We recommend expedited 2nd day air shipping (if you are not within a 2 day ship time via ground service) and/or cold shippers for orders where you want to minimize the risk of melted chocolate, and that it is delivered where someone will be there to accept the package at time of delivery (work address if not home during the day). We cannot accept responsibility for melted chocolates, so please order at your own risk.